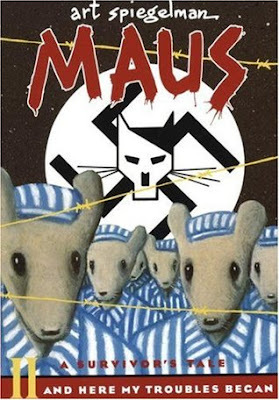 Acclaimed as a quiet triumph and a brutally moving work of art, the first volume of Art Spieglman's Maus introduced readers to Vladek Spiegleman, a Jewish survivor of Hitler's Europe, and his son, a cartoonist trying to come to terms with his father, his father's terrifying story, and History itself. Its form, the cartoon (the Nazis are cats, the Jews mice), succeeds perfectly in shocking us out of any lingering sense of familiararity with the events described, approaching, as it does, the unspeakable through the diminutive. This second volume, subtitled And Here My Troubles Began, moves us from the barracks of Auschwitz to the bungalows of the Catskills. Genuinely tragic and comic by turns, it attains a complexity of theme and a precision of thought new to comics and rare in any medium. Maus ties together two powerful stories: Vladek's harrowing tale of survival against all odds, delineating the paradox of daily life in the death camps, and the author's account of his tortured relationship with his aging father. At every level this is the ultimate survivor's tale - and that too of the children who somehow survive even the survivors. The Maus Volumes are graphic novels written and drawn by Art Spielgelman to share his parents' holocaust survival story with the world. Now let me just start out by saying these have to be the best graphic novels I have read in my life so far. All I knew going into these novels was that they had to do with the Holocaust and the Jews were depicted as mice and the Nazis as cats. As soon as I heard this, it went straight to my priority to-read list. I loved how Art Spielgelman chose to tell his parents' story. These graphic novels play out in that you start out by viewing Artie as he is talking to his father and asking him to narrate his holocaust stories, and as his father narrates, we then get to see everything that happened to him in his horrifying holocaust journey. I really enjoyed this because we got to see both the present situation in the lives of both Artie and his father as well as the past holocaust experiences from his father's POV. The events Artie's parents had to endure during the Holocaust are sickening and absolutely horrible. Just knowing all of it is true is what makes it even more awful. Through out the novels we even get insight into Artie's struggles of growing up as a child of Holocaust survivors. I was surprised at first to see in between there were a few parts that made me laugh and served as a bit of comic relief after page after page of violence and grief, but it was greatly appreciated. I was not sure how I would enjoy different groups of people being represented as animals, but it all was executed beautifully. While the black and white artwork style might not seem stunning, it worked very well with the the story's plot and tone. I think what I respected most about these graphic novels is how elaborate and brutally honest they were. 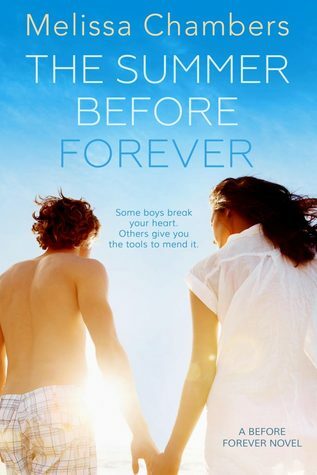 By the end of the story, I felt as if I could really see all the main characters for who they really were. Yes these books are very depressing at times and I cried more than once, but the story was also funny and enlightening as well. I am usually not a fan of graphic novels or comics because I always feel a bit empty...as if it is missing some depth and detail to it, but I definitely did not feel this way about these two books. 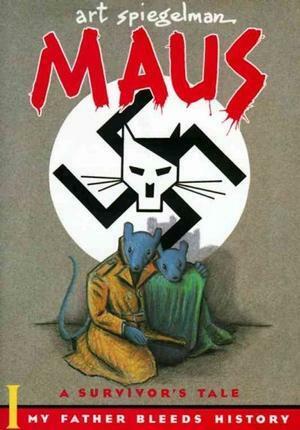 Conclusion: I would definitely recommend the Maus graphic novels to everyone. 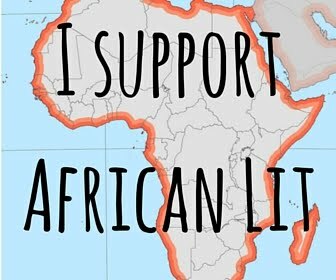 I have to warn you that main story line is very sad and sickening, but the good thing is that these novels still have a hopeful aspect to them and are beautifully executed.